The 'exact' science cannot understand color phenomena. This really fascinating book, written in a style that is understandable for an interested layman, deals with all the varied facets of this subject. 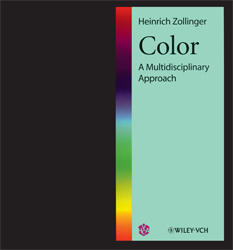 What do we Mean by Color? How Many Causes of Color do we Know? What does the Eye tell the Brain? HOW DO WE NAME COLORS? However, these criticisms do not detract significantly from the usefulness of the book and the stimulating ideas that it offers. Unfortunately the high price of the book is a matter for concern, especially since it is not meant to be a specialized book with a small readership. Certainly this does not reflect the author s intentions, nor does the wasteful style of page layout, in which the text occupies only 40 %of the space. The rest of the space has been used for illustrations in only about 1/7 of all pages, and five pages are left completely blank. Nevertheless, the book is highly recommended to everybody who is not deterred by its price and has interests in the general area of color. Angew. Chem., Int. Ed. 2001, 40, 1550.